Our home is decorated in the Tuscan design. Wine themes are big when it comes to decorating in the Mediterranean style, so I always look for ways to decorate my home this way. I always look for wine themed designs. My husband and I are wine aficionados, and we visit wineries whenever we travel, so I made it a point to save every wine cork over the last couple of years until I had enough to make a Wine-cork wreath. I even saved some from some special dinners we attended for special occasions. There were approximately 150 corks that were needed for a 15 inch wreath. You can also buy wine corks at a craft store. 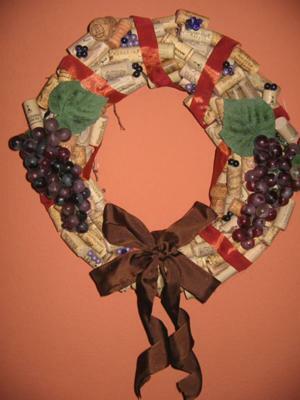 Using a grapevine wreath form purchased at a local hobby shop, I used a glue gun to glue all of the wine corks around until I used them all up. I added some pretty ribbon attached with straight pins in the back and wrapped it around. I added plastic grapes and leaves, and then glued on some purple beads to look like small grape clusters. The finishing touch was a pretty ribbon that I tied around the bottom. It's a great way to decorate and create memories.